Charts and explanations explaining need and why our proposals will work, keep us safe and reduce prison population at least by half. Washington State may be a good template/links to docs below. 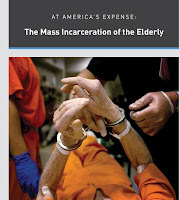 This essay and bill proposal is written in response to the growing call in Wisconsin for building a new prison because of concern over violence in the juvenile prisons, lack of staff and extreme overcrowding and tension in the adult prisons.One of the proposals of the The DOC has been to build a prison for the elderly and handicapped and those with special needs. This same proposal was made for the building of the last new prison, New Lisbon Correctional Institution(NLCI) and as soon as it was built, the needs of the bulging correctional system overruled the need for the new building original purpose and NLCI became just another prison. The system is even more overcrowded and understaffed now. Whole prisons routinely go on lock down because of staff shortages and the already sparse programming and treatment hits near zero. Particularly concerning for prisoners in general population is the frequent cancelling of rec, library, and outdoor time. All the rehabilitative tools vanish in this environment and staff shortage, particularly professional shortage of professionals ( psychology staff, health staff)are felt everywhere. The guards that remain are forced into 2 , sometimes three shifts overtime. According to An article by Pat Marley in May 2018, taxpayers paid 40 million in overtime last year alone. The prisoners are stuffed into every crevice- often two in a single solitary cell where one person has to sleep on the floor next to the toilet. We know of three suicides and one suspicious death in the last three months in the solitary confinement units and the public is not notified, the prisoners themselves that strive to get the word out. Conditions are horrific. One wise legislator said “ We are not going to build our way out of the present crisis” and he is right. Those who want the new building without changing how the DOC is run, are reveling in taxpayer money that an increasing prison population brings to their individual bank accounts. In our view, The WI Department of Corrections is neither rehabilitating offenders nor keeping the public safe . Starting with the prison boom around 2000, the DOC powers decided to increase population at all cost in order to receive federal dollars and since has abandoned its mission completely. Now the fact of serious overcrowding and lack of staff makes any healthy DOC mission a joke. And it is this overcrowding, and resulting lack of staff ,lack of training and treatment for prisoners that needs to be addressed. This is a critical issue for taxpayers also because the funds for this boondoggle come directly from funds that used to support education and other community needs. We are holding over 2000- ready to be released Prisoners, all over thirty when for most crime ceases and nearly 50 percent of our prison population are there for rule violations made while on supervision or parole-non felonies! Add to this the fact that each year the DOC is forced by law to release thousands of truth in sentencing(TIS) prisoners, mostly young men under 30, and they are almost literally dumped on the street with no treatment or training , in far worse shape than when they entered the prison. In short, we need to look at who we are holding and why and see that only those who need to be separated from society and held in our prisons. Those who remain in prison need to be treated humanely and wisely. IF we do this, we will have system where people want to come to work, where prisoners will get the treatment and training they need. And the public will be safe while having their once incarcerated love ones back home and participating . A.) Reduce prison Population by Paroling those eligible and ready for release and ending reincarcerations for non felonies. Theses rules will work and as they are true to the intention of the parole rules before truth in sentencing and the prison boom came to town. Most prisoners were released after serving one quarter of their time and they did receive training and treatment and in many cases, college degrees while in prison. These proposed rules will ensure that those prisoner s that are ready will be release. 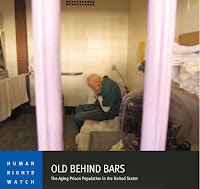 All old law prisoners are over 30, many in their 60’s and 70’s and are long past any inclination to commit new crimes. A few years ago FFUP submitted a compassionate release application for three prisoners. It was not serious considered . We were told that they did not meet the criteria and sited the compassionate release standards for TIS prisoners. Since then our multiple tries to get this executive order honored have failed. These are good standards and need to be put into law in a form that cannot be ignored by the DOC. Perhaps another application submitted by all our groups is in order as it would certainly be a good education tool . 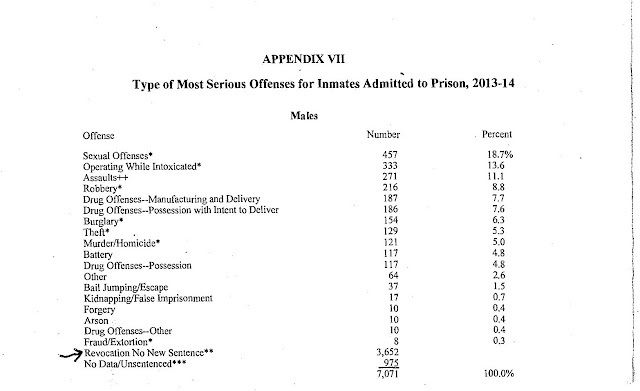 C.)End Revocations for non felonies- around half of new admissions each year are for rule violations-no new charges. ( see DOC chart Page 3 ) We agree with prisoners that the system sets the prisoners up to fail- they provide no treatment and little training while in prison and then grab them back for the rule violation, ensuring taxpayers funds keep rolling in seamlessly. We are working on this part of the bill and want something that not only ends revocations without felonies but set up viable alternatives. Perhaps one approach is to have a study committee set up. The Washington state has a program we are researching which sounds promising. Note: Most of FFUP ‘s Work is with solitary confinement prisoners and we have a multi-plaintiff lawsuit going painfully through court now. Please consider allowing us to be part of your work on this issue. We do have the data, stories and solutions. Prisoners and FFUP have worked out rules and policy changes that we feel are practical and safe. Funding for busing coordinator and a fund to help pay for families who cannot afford fare. We have been told by 2 van owners that fares will be reduced if vans are filled and that will be coordinators main job. 2)Ask for funding for Project patterned after POPS program CA- one paid coordinator, rest volunteers, and funding for materials/Volunteers line up supports for prisoners, help them in transition, find mentors while in prison- probably good to have someone funded who works at Project Return or with EXPO- should be an ex-prisoner. ALL old law prisoners would be eligible for program, and TIS as they come up for release. /could possibly be part of UM LAIP or WIP-or an adjacent program. Will talk to them if you agree. A particularly popular one is a place of refuge for prisoners after release- some would stay temporarily, some would build their future from here- the plan is for a sustainable community. There are many of these proposals, this one, spiritually based, is the most recent:This is the vision of two prisoner, they are sending a more down -to earth plan/summation. All this tax money spent goes to what we call “the prison industrial complex”- all the corporations and economies that feed on incarceration, and it is taken from schools and public services, treatment centers and community self help projects. THIS is the reason our college kids reel under tuition debt- in state university tuition was around 200 dollars a semester in `the 70’s when many of the baby boomers went- Now?? 10,000 a year? 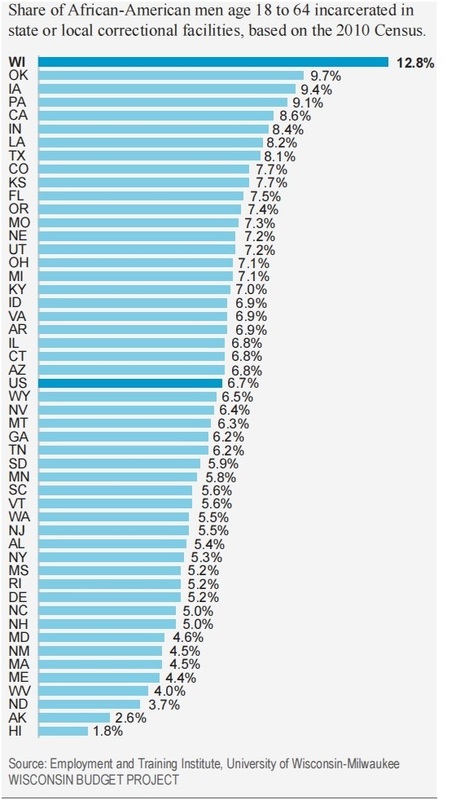 Look at chart above- this is why: THIS is where is your tax money going? Our kids reel under the burden of student debt largely because we support the corrections industry and not education. 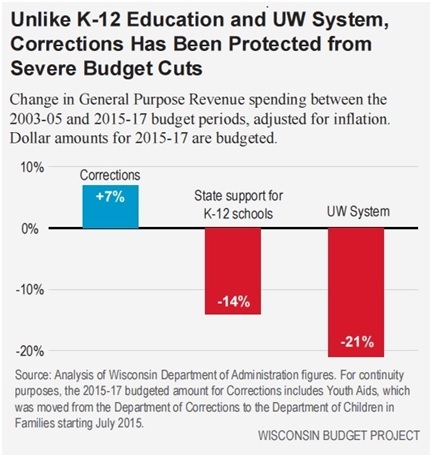 While the budget for the DOC rises (7%) in graph above for 215-17 , budget for k=12 drops by 14% and the UW system drops by 21 %. WHY? 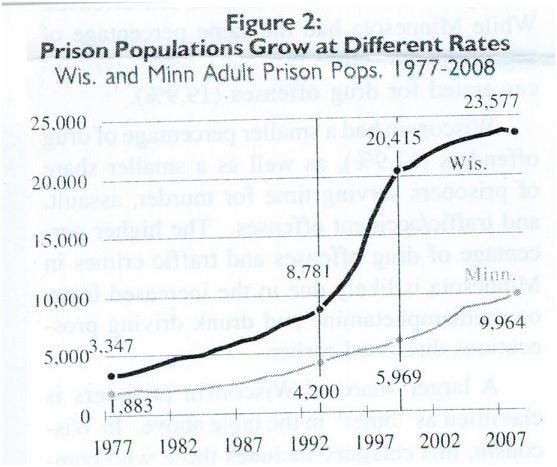 Look again at the prison population graph above: When the prison book started, around 1990, WI had about 7000 prisoners. Today it has 22,000. That is where our taxpayer money is going. Below :An overview of Wisconsin’s shame: Highest incarceration rate of African Americans in the nation. Black men especially are funneled into our prison system- all factors exaggerate this trend l and a study by the UW Wisconsin Budget Project ( chart below) shows that over incarceration actually causes crime. We who deal directly with prisoners often here that the younger prisoners, those on truth-in-sentencing, often never knew their dads except on prison visiting days. The communities that were main support are broken and gangs are what these kids turn to survive. Once out of prison, the revocation policies and lack of support make staying out a real challenge. SO HOW would our proposal work? 4)Put money and energy saved into treatment and training and community support, make the WI DOC Fulfill its mission to rehabilitate offenders and keep citizens safe. IT does neither now. Research has conclusively shown that long before age 50, most people have outlived the years in which they are most likely to commit crimes. 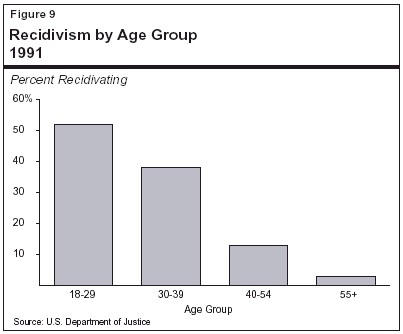 The figure below shows the percentage of individuals arrested nationally by age in 2004. Less than 6% of individuals ages 30-34 were arrested, whereas a little over 2% of individuals ages 50-54 were arrested and almost 0% of those age 65 and older were arrested. 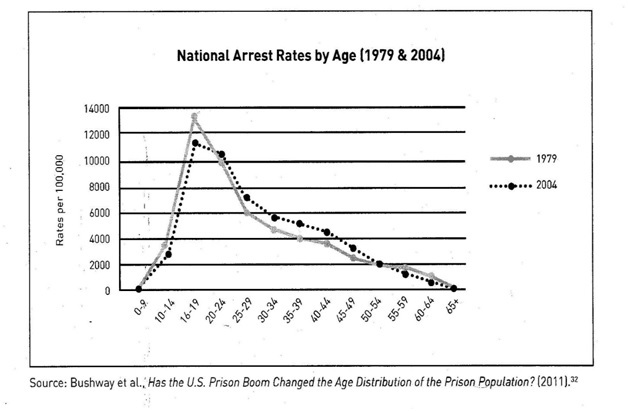 This trend of decreasing crime rates from adulthood to old age has held constant over time, as shown by the 1979 arrest curve . WI Old law inmates are all over thirty and in the main are not dangerous. In sum: Studies show that most non corporate crime is committed by people under thirty. Period. A recent and incredibly detailed study by the ACLU went state by state to get data and found that after 30, the percentage of prisoners to reoffend was 6 %, after 55 it dropped to zero. This and studies by the FOB and other organizations showing similar findings need to be given much consideration when deciding whether an mature or elderly inmate, once violent, is still a danger. People change. All old law prisoners are over thirty (crimes committed 15 plus years ago) and about a third of our nearly three thousand old law prisoners are over 55. Many are fathers, grandfathers. 2)Another thing to keep in mind is that our parole rules ensure that only those who have shown to be ready for release into the community are paroled. 2) you have not served sufficient time for punishment." The intention of the parole statute these prisoners were sentenced under was that 25% was the time for punishment. Our rule proposals use that marker and after that release or not depends on behavior. 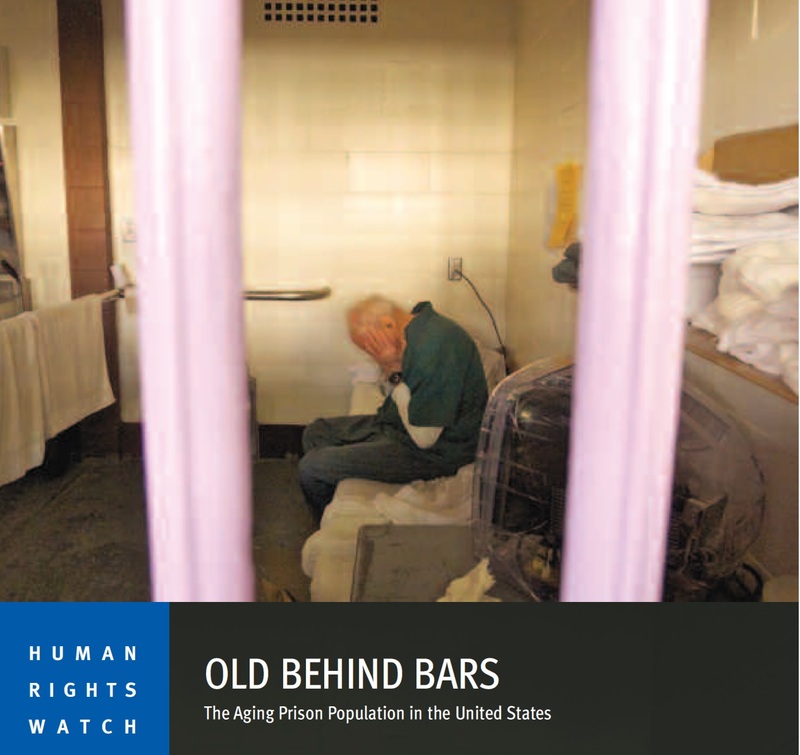 Our society has not come to grips with the human rights violations and sheer inhumanity of holding the elderly in prisons, which are built for able bodied people. We are incarcerating people longer than ever before in history. Here are two excellent studies that seek to bring us to awareness. 3)But the disaster only begins here: We are spending our tax dollars incarcerating people that do not need to be there while we neglect the treatment and training of those that really need help- the truth in sentencing prisoners. It is a heart rending contradiction:Truth in sentencing (T-I-S) prisoner are given an out date the DOC must follow. These are mostly kids . 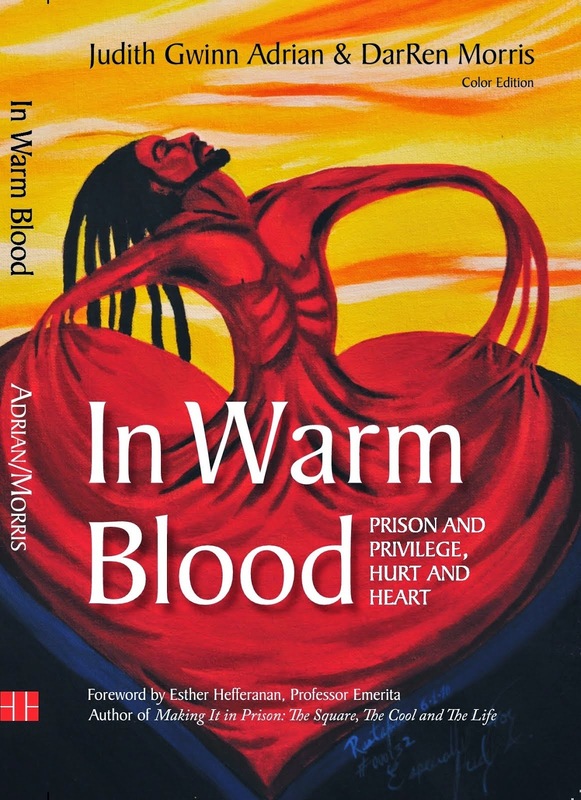 While the DOC is spending all its resources on keeping the Old law prisoners entombed and the overcrowding has reach crisis proportions, there is no training or treatment for the vast amount of truth in sentencing prisoners. They come in drug addicted and go out drug addicted and traumatized. Our society does not provide treatment for its mentally ill anymore unless they have big bucks so they are funneled into the prison system also. Over a third of prisoners are mentally ill we are told. And they are literally dumped on the streets with little or no support on their law mandated release, most to be whisked back in for a rule revocation. Putting OLD LAW and TIS together = The DOC maintains their overcrowded prisons, and staff quitting in droves because forced overtime and rising tensions – it maintains the dysfunction with relative ease because of the policy of reincarcerating prisoners for non felonies. Some parole agents, we are told , brag of their zero success rate. What most released prisoners get: a three month temporary room, no money , no bus pass, no phone, they get food stamps from the government and a state ID and they get a strict curfew. Those prisoners who do have people who want to take them in are often denied for various reason- most end up in these TLPs and from there they are supposed to get a job pronto. Transportation to jobs? Phone? The activist community is working hard to connect these stranded folk with outfits that help but the need is great and the help is fledgling. Look at this chart below, finally. Look at the second to last line: 3652 people admitted without new charges- rule violations as small as going out to get a package on the lawn after curfew or being late to an appointment. One man was revoked for screaming “I am going to kill myself” after he was not given his medications . That screaming was labeled an “assault”. Because these people are poor and without lawyers they are putty to the justice system. of paper on his prison cell while he was incarcerated for 27 years on Robben Island. that there will be violence. pot lucks with families in the maximum prisons! And there were free buses to the prison! rehabilitation and real public safety. .